It's not uncommon for temperatures in Wichita to reach 90°F or higher during the summer months, and when the hottest parts of the year arrive, you need to be able to keep your home cool and comfortable while keeping your energy costs in check. Most homeowners know that they want their AC to work great when they need it most, but they still won't have their air conditioner serviced until the unit has developed serious problems. By the time many homeowners have their air conditioners serviced, the repairs they need will be much more complicated and expensive than if they had been taken care of earlier. At Ball Heating & Air Conditioning, our heating and air conditioning contractors work to keep your cooling system in the best shape possible throughout the year. As soon as you notice any problems with your AC, call our professionals, and we'll be ready to tackle the job. The best way to make sure that your air conditioning system doesn't develop any serious problems is to make sure that it's regularly maintained. Well-maintained AC systems will have very few problems and they'll also use much less energy. Some of the maintenance will need to be performed by a professional—our air conditioning contractors offer tune-ups for AC's, which we recommend you have performed at least once annually. Other kinds of maintenance, like changing your filters regularly or removing blockage from your ducts, can often be completed without professional assistance. When you need to have your air conditioner repaired because it's not supplying cool air, it's only working intermittently, or you've seen an unexplained spike in your cooling costs, our professional will first ensure that your filters are clean and that your ducts are clear. Most of the problems that you'll encounter with your Wichita home's air conditioning system will occur with either the compressor or the condenser. The compressor sends cooled air, or “refrigerant”, into the ducts to be distributed throughout your home. Anything that restricts this airflow makes it more difficult for your air conditioner to function, which raises your energy costs. Your AC's condenser removes hot air from your home. If you place one of your hands near the condenser, you should feel hot air escaping. If you don't, there's a likely a problem. Any problems with either of these two components can cause a number of different issues with your AC system. If you notice problems with your compressor or condenser, cal our professionals as soon as possible. 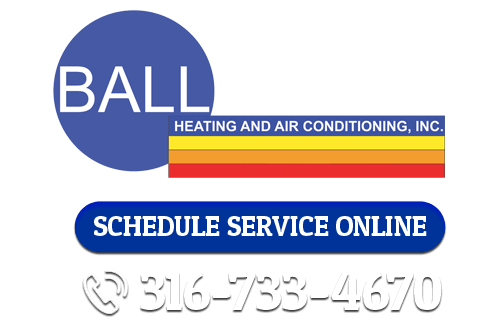 If you need air conditioning repairs in Wichita, call Ball Heating & Air Conditioning at 316-733-4670, or fill out our online request form.